Irene D. Zepezauer, 87, of Sunset Road, Port Washington died Thursday, January 30, 2004 at Heritage Nursing and Rehabilitation Center in Port Washington. 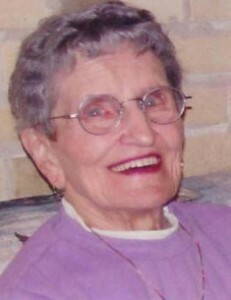 She was born June 19, 1917 in Pike Lake, Wisconsin to John and Mary Cherek Wojcik. Raised in Bevent, Wisconsin when she was in eighth grade the family moved to Chicago, Illinois. She later recieved her teaching degree in Chicago. She moved to Milwaukee and began work for American Can. She met Joseph R. Zepezauer of Milwaukee and they were married May 1, 1943. Irene began teaching at Our Lady of Sorrows Catholic Grade School in Milwaukee. She retired in the early 1970’s. In November, 1986 they moved to Port Washington. She enjoyed traveling, friends and family in her retirement. She was a happy person who loved her grandchildren and was faithful to her religion. She is survived by her daughters Gerri (James) Schoenborn of Port Washington and Carol Drefahl of Eldorado, Wisconsin, grandchildren Laurie Englehardt and Joey Schoenborn. Further survived by Brother Bill (Maryann) Wojcik of Bevent, Wisconsin, sister Vi Kaczmarek of Evansville, Indiana, nieces, nephews, other relatives and friends. Preceded by a brother Jim Wojcik. Rev. David Meinholz, pastor will celebrate a Memorial Mass of Christian Burial will be held at NOON on Saturday, January 8, 2005 at St. Peter Of Alcantara Catholic Church, 1800 N Wisconsin Street, Port Washington. Family will receive friends from 11 am until the time of the service.